Zinedine Zidane dropped his first points since he took on the manager job at Real Madrid. 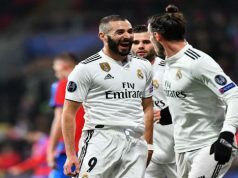 Los Blancos failed to recover from Betis early goal and only managed to savage a point thanks to Karim Benzema’s strike in the second half. Betis were very intense in the first minutes. Ruben Castro had a great chance to score with a powerful strike from close range, but Navas got down to make the save. In the follow-up, Fabian nudged the ball to Cejudo, who hammered an incredible shot into the top corner. 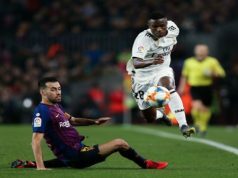 The goal was a big blow for Los Merengues. Betis were exerting a bit pressure and they were struggling to dominate possession. Yet, things started to change as the hosts started to get tired. 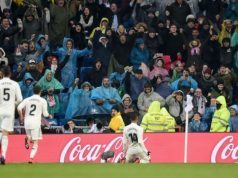 Los Blancos had a good opportunity to level as Benzema set up Ronaldo inside the box, but the Portuguese fired wide of the post. In the next play, Pepe jumped unmarked inside the Betis box to meet a corner from Kroos, but his header misses the target. There was a penalty call before the break, as Benzema went down inside the box under a challenge from Petros. It looked like a clear penalty, but the referee was not interested. The visitors improved after the break. With Betis totally exhausted, Zidane men barely let their rival touch the ball during the second half. However, Real were not very lucky tonight. Marcelo found Carvajal inside the box, but the right-back sent his effort wide of the post. In the next play, Benzema made it 1-1 as he received a pass from James and fired home from close range. Los Blancos had plenty of chances to complete their come-back in the last twenty minutes, but Adan saved his team. He denied James, Benzema and Ronaldo with three superb saves to secure the draw.